Imagine your home without window treatments. Aside from feeling very exposed with the urge to duck behind a piece of furniture, I bet you also feel like the space looks unfinished and bare. That’s because window treatments play an important role in your home decor; they provide privacy, filter light, frame views to the outdoors, and enhance the look and feel of a space with their color, pattern, and shape. In a house full of windows you may find yourself opening and closing the drapes and raising and lowering the blinds multiple times in a day. How many times have you left for work or vacation and then realized that you left the blinds wide open? A motorized shade system can make window treatment management a snap and alleviate your privacy worries while you are away from home, which is why the Hunter Douglas Powerview® system is one of our favorite smart home innovations. How does a motorized shade system work? The Powerview Motorization system works through wireless communication to raise, lower, traverse or tilt window shades. It’s compatible with all types of shades including honeycomb, roman, pleated or roller and allows you to control your window treatments through your smart phone, tablet or remote control. The system’s app allows you to set “scenes” such as Wake Up, Reading, Lazy Saturday, or Movie Time. You determine what position or light filtration you prefer for each scene to create the exact ambiance you desire. You can do this for every room in your house and can create schedules to activate each scene as you see fit. The system can even be linked to local sunrise and sunset times! Once you set up your scenes, you can literally set it and forget it. And the system is very quiet, another big plus! The wonderful thing about a motorized shade system is its convenience, especially in homes with many windows and in cases where they are large or hard to reach. There’s no need to make the rounds to every window to adjust the shades multiple times a day and if you have to leave unexpectedly (or forget), privacy is as simple as accessing the app on your phone and pushing a button. We believe a motorized shade system is the perfect marriage of beauty and function. If you are interested in learning more about incorporating the smart decor of a motorized shade system for you home, please contact us to set up a consultation today. How do your outdoor living spaces look? Do they invite you out? As the weather warms and our gardens come alive, we tend to crave time outside in the sunshine. There’s no better place to do that then your own backyard. One of the biggest trends in decorating today is extending your living spaces outdoors. As homeowners maximize the use of their indoor areas they are finding that an easy way to create more space is to invest in decorating their porches, decks and patios. The challenge is that many homeowners don’t know how to approach furnishing and accessorizing outdoors. At Decor&You, we apply the same focus on style and function to an outdoor space as we do indoors, treating it like a room or rooms, not just an adjunct area connected to your home. With the following guidelines, you too can create outdoor spaces that will become some of your favorite spots to relax and entertain guests. The first step in creating an inviting outdoor destination is to decide how you want to utilize the space. Do you want an area to relax in the sun and read a book or a place to sit and chat with your friends while enjoying a glass of wine? Or perhaps you would like to cook or grill meals outdoors and have a dining table to host dinner parties. Once you have decided how the space needs to function, develop an outdoor room arrangement plan to define each of the areas and how they will flow into one another. Comfortable seating, tables, overhead and accent lighting and colorful accessories are some of what goes into creating functional and stylish indoor spaces. The same holds true outdoors. The options are limitless when it comes to outdoor living room and dining furnishings. From cozy weatherproof fabric sectionals to classic rattan or wrought iron, you can easily find something that has your unique design aesthetic. Don’t forget the accessories like pillows, plants and area rugs. These help to make the space feel more finished. For additional comfort, you must consider the heat of the sun on hot days and the chill of the night air when the season’s change. Options for shade include umbrellas, awnings or pergolas. A fire pit or fireplace is a great option for adding both warmth and ambiance. Depending on your surroundings, privacy may or may not be necessary. If you have neighbors close by or would like to create a space that’s a bit more secluded we have a few suggestions. Drapery panels look fantastic if you have an outdoor space that has a roof or structure where you can install them. Other options include building or purchasing stand-alone privacy walls or placing tall plants that will shield your space from view. Are you ready to get started on your creating your own outdoor destination? Now is the perfect time to be enjoying the nature and beauty of the outdoors. If you need assistance, we would be glad to work with you to discover and design a space that is uniquely you. In our experience here at Connecticut Decor&You, while the modern bedroom embrace open floor plans for large airy abodes, many of us are still working with small spaces that don’t speak kindly to the contemporary trends. But this doesn’t mean you can’t create a stylish and livable space. Let’s take a look at how to make the most of your small bedroom for a soothing and comforting atmosphere you long to enjoy every night. One of the easiest ways to enhance your small space is through the use of white and off whites. Think plain and simple especially for walls. Also, consider limiting your wall décor. The goal is to draw the eye to a window where it can explore what’s outside instead of being attracted to the wall itself which creates an inward feeling. Now, we understand that an all-white theme is not for everyone. Adding your favorite color to the mix is a welcomed addition to your bedroom we just caution in the use of too many bright or bold colors. Think thoughtful accents against a white backdrop to solidify the openness you crave. Or at least minimize them. You want to invite natural light into your space which cannot be accomplished with thick, bulky drapes. Instead, opt for flat panels of soft sheer fabric. 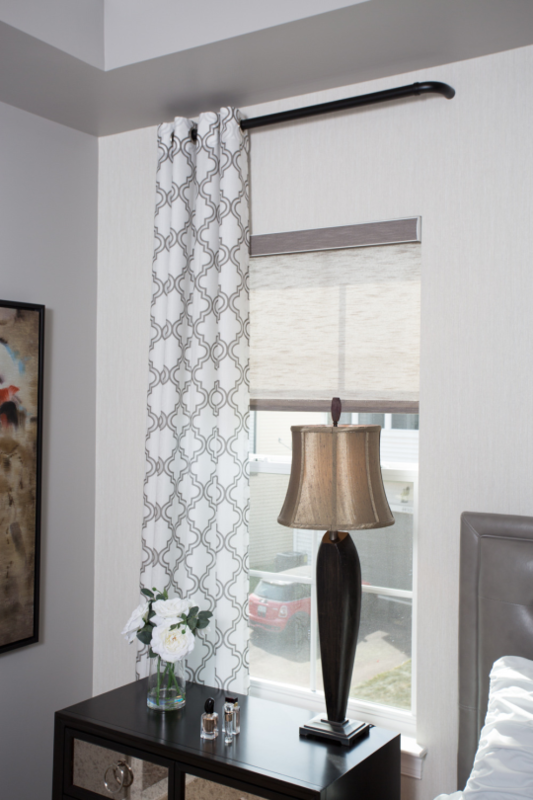 Roller blinds are also a good option if kept naturally-inspired. While you’re considering your window, think about placing one of your most used pieces of furniture under it. Whether it’s your bed or favorite chair, you can create a great place to enjoy the natural light while turning your focus outward instead of being restricted within the confines of your room. Old closets often create drab looks and feelings. Bring a modern edge to your bedroom while maximizing storage and functionality with customized built-ins that replace your closet space. This concept is great for keeping your room organized which is very important in any space-restricted area. You will negate the invitation for clutter to gather on the ground or in other dead zones a closet can create. Complete your look with sleek doors that produce a minimalist finish. Multi-tasking furniture is necessary in a small room and this includes your bed. Have a customized bed designed to fit perfectly into a corner or under a window to effectively use every inch of the floor while also providing extra storage above, below or to its sides. There are several ways to turn your bed area into desired book shelves, display cases or clothing storage. Try a customized headboard to create shelves or cupboards out of a typically nonfunctional space. Extend this storage space beyond the boundaries of the bed and it can double as a bedside table for subtle lighting and your favorite book. And never neglect under the bed storage which works fabulously for clothes and other personal items that are better tucked away behind closed doors. If you still need extra shelving or lighting, consider wall-mounted fixtures to save on floor space and to relieve the chaotic feeling that can occur when you can’t see the floor. Finally, try transparent furnishings for any additional chairs or desk space you still need. You will create the illusion that these furniture pieces aren’t even there. There’s a new movement in outdoor living and it’s bringing the indoors outside. When we are inside we like to enjoy the view and the natural light from the outdoors. But when we are outside, we want to bring the comfort and style from inside our homes to our outdoor spaces. In recent years,we have worked with many Nation wide homeowners who are looking to create outdoor living rooms. This is a far cry from a simple weather resistant dining set and umbrella. Careful thought and planning goes into designing a great outdoor space and we have a few secrets to making it a success. Focus on designing a functional space with a consistent look. 1. Your outdoor living room should be as cohesive as your indoor spaces. This means thinking about how you want to use the space and what type of design aesthetic you envision. Consider how many people you want to be able to seat for entertaining. What type of environment would you like to create – casual and relaxed or elegant and formal? How will this space work with adjacent areas? 2. Choose comfortable sofas, sectionals and/or seating in weather resistant fabrics. There are some fantastic options out there from great, slipcovered sectionals to wicker and rattan pieces with cushions. Think about adding ottomans or chaise lounges for maximum comfort. A professional decorator has access to quality furnishings and knows how to pull them together in ways you might never imagine. 3. Don’t forget tables. Again, consider how you want to use your space. If you’d like to enjoy snacks and cocktails in your outdoor living room, you’ll want a coffee table and side tables. 4. Accessorize! No space is complete without accessories. An outdoor rug is a must to tie your décor together. Pillows, ottomans, candles, and throws will make your space feel welcoming. And don’t forget to add some plants and flowers! 5. Use color and pattern. Feel free to go bolder here than you are comfortable doing indoors. The outdoor setting will embrace brights in a way that an indoor space cannot. Are you ready to bring the indoors out and create an outdoor living room? 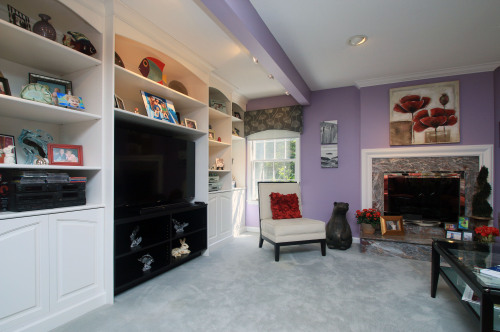 Call Decor&You at 203-405-2126 today and let’s create a space you’ll love for years to come. Creating a beautiful layered light plan is really an art form. When done correctly, lighting will evoke a certain mood in a space. Think of your favorite local restaurant or spa and how you feel when you visit. Wouldn’t it be wonderful to create spaces like that in your own home? It can be done with a layered lighting plan. Layered light plans include multiple sources and types of lighting to maximize functionality and enhance ambiance. It simply isn’t possible to achieve both of these with one light source in a room. 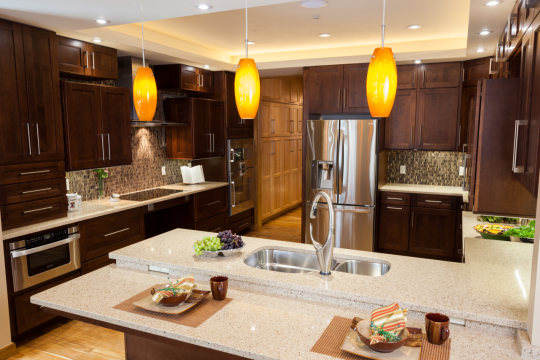 There are four main types of lighting that must be considered to build your plan: natural, ambient, task, and accent. All lighting plans begin by looking at the natural light in a space. This creates your canvas, so to speak. You want to understand how the natural light affects the room during the day so you can direct it appropriately and compliment it with other light sources during the day. Ambient light has the important job of setting the mood by providing the main source of overall lighting. Its main function is to deliver enough light to safely maneuver in the room. The color and intensity of this light is important as it sets the tone and creates the base from which the rest of the lighting plan will be built. Ceiling mounted lights such as chandeliers, recessed lights, wall sconces and table or floor lamps are common sources of ambient light. Just as it sounds, task lighting serves the specific purpose of providing light do perform specific tasks. This could include reading, food preparation or shaving for example. Pendant lights, vanity lighting and under cabinet lighting are all great sources of task lighting as they offer very targeted illumination. Last, but certainly not least is accent lighting. The purpose of this layer is to highlight specific objects or features within a room to create focal points or provide direction. Track lighting, interior cabinet lighting, or wall-mounted fixtures are good sources for accent lighting. One of the services We provide for homeowners is lighting plans. Our lighting plans incorporate beauty and function and create the appropriate mood or feeling for a space. Please call 203-405-2126 for more information or to find a Decor&You near you. It’s that time again when color experts are announcing their top color selections for the coming year. Earlier this Fall,we reported Sherwin William’s pick of Poised Taupe http://decorandyoublog.tumblr.com/post/151375897691/move-over-gray-theres-a-new-taupe-in-town, a combination of earthy brown and conservative gray. Recently we learned that Benjamin Moore and PPG Pittsburgh Paints both chose shades of purple for their Color of the Year, Shadow and Violet Verbena respectively. The two are very different, though both firms noted their decision was based on their hue’s ability to evoke a sense of nostalgia. 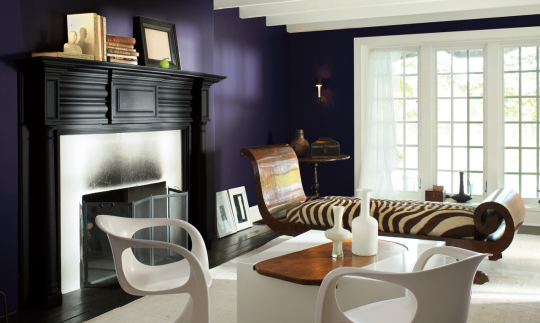 Benjamin Moore’s Shadow is a rich amethyst with the ability to reinforce shadow and light. 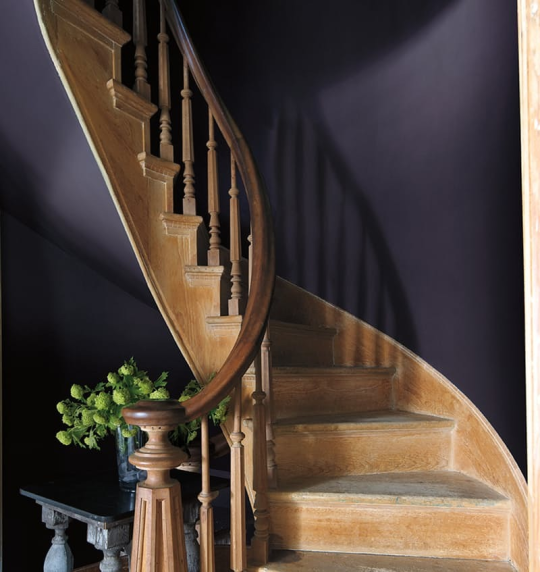 When used in decorating, this dramatic Renaissance purple can become the star of the room or work to stabilize other shades found within its surroundings. The selection committee, an assembly of designers from diverse backgrounds, found inspiration from art exhibits, fashion, architecture, and other cultural influences both domestic and abroad. This year, they were highly affected by what they saw happening in the arts around the globe. PPG’s Violet Verbena, a grayish purple has been called a chameleon for its ability to work well in different settings and design aesthetics. A total of 26 color experts from six different countries debate the options for three days before making a decision. Representatives from diverse industries such as architecture, automotive and consumer electronics study everything from fashion blogs and movies to the latest technology. Violet Verbena was selected by PPG’s group to bring a sense of calm and enable our collective desire to lead an uncluttered lifestyle and disconnect from our ever-present cell phones, laptops and other electronic devices. So, 2017 could be the year of purple. What do you think? Do you like one of these shades better than the other? When choosing color for your home, we always recommend first considering the palettes you gravitate toward and the existing furnishings in your home. Beyond that, you should also look and how existing and new colors will flow throughout your home. Need help? You don’t have to tackle it alone. Simply contact us at Decor&You 203-405-2126 and request to schedule a color consultation in your home. This Year, Why Not Make a New Kind of Resolution? Each New Year is a fresh start, a blank canvas that you can use to create something new and exiting. Now we know there are all sorts of resolutions you can make, but we have a suggestion for 2017. Why not make your home the focus this year and take on a few decorating projects to create spaces you will love? We bet you will be amazed at how much happiness having a home that reflects your own style will bring you. Make 2017 the year to love your home! Take a look at our list of decorating resolutions and pick a few to try. 1. Create an accent wall. Choose a room you spend a lot of time in, like your bedroom or living room. Create an accent wall with paint or wallpaper. Look to the other items in the room for color or pattern inspiration and select something that will provide a focal point. If you need help, check out our tips for choosing paints colors. 2. Incorporate color. 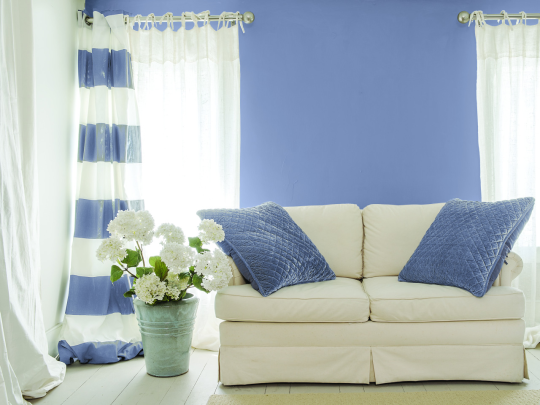 Step outside the neutral zone and bring a bold hue that you love into your décor. Simple ways to do this include paint, accessories such as pillows and throws, hanging new artwork, or a vibrant new area rug. For tips on finding your color confidence, click here. 3. Accessorize. Bring personality into your space by accessorizing. Start with a coffee table or bookshelf if you are just getting started. If you aren’t sure where to begin, read our blog on artful accessorizing here. 4. Spruce up your window treatments. Take a walk through your home and take note of the window treatments in each room. Are they providing enough privacy, allowing enough light in or blocking it out as needed? Pick a room or two that could use some updating and follow these tips. 5. Create a cozy outdoor space. Your deck, porch or patio should be natural extensions of your home. Too often these spaces don’t get as much decorating attention as our indoor spaces. 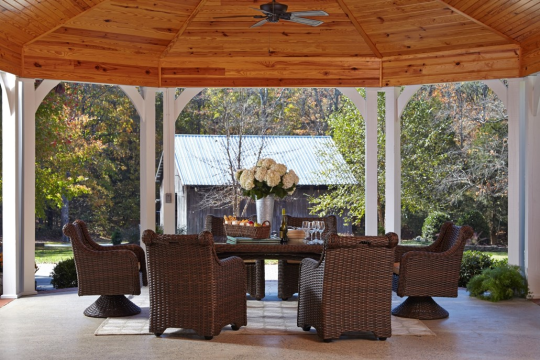 For some great ideas, read our blog on Creating an Outdoor Living Room. 6. Replace worn or outdated furnishings. Take a quick inventory of your older pieces and determine whether they are ready for replacement. If you have a piece that still has good bones, consider reupholstering it. If you feel your home is ready for a major decorating project or you’d like assistance completing one or more of your resolutions, please give us a call at 203-405-2126 today!